Jotaro Kujo, grandson of Joseph Joestar, has a problem. He’s possessed by an evil spirit. A visit from his grandfather, and an associate, reveals that the spirit is actually a psychic representation of his inner power. A Stand. Joseph reveals that Jonathan Joestar’s nemesis, the vampire Dio, has returned. His reappearance has caused the awakening of the Stand in the Joestar family. After an attack by another Stand user, under the control of Dio, and after his mother falls ill when her own Stand awakens, Jotaro and co must travel to Egypt to defeat Dio, before the Stand kills his mother. 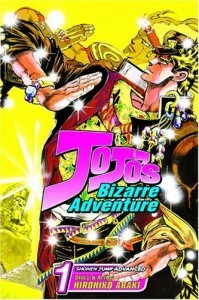 But nothing is easy when on a Bizarre Adventure, and even on the plane they are attacked by another of Dio’s servants. First of all, it’s a crying shame we only got part three licensed in the States. While part one is summarized before the volume starts, it doesn’t quite capture the ludicrious grandeur of the full manga. Nor does it cover Joseph’s adventure, an adventure escalated from the first. Both are ridiculous, and both are glorious, and it’s a travesty that we didn’t get the full story. However, what we did get was a good starting point. Part three introduces the Stand, the power that replaces the Hamon power used in the first two parts. And considering that the Hamon has nothing to do with what comes after this, it fits that the first introduction Western audiences get to JoJo’s Bizarre Adventure would be part three. JoJo’s Bizarre Adventure is an interesting series in that it’s both amazing, yet at the same time there is a lot that would drive people away. For one, the art is just…well it’s really silly. It certainly doesn’t bother me, but anyone that likes things like properly functioning anatomy will be driven to madness. Unless you like impossibly dynamic poses, this series isn’t for you. As for myself, JoJo has creative fights, creative powers, characters that I can actually connect with, so really I have no complaints. Perhaps I might complain about the silly art, but that’s just part of the charm. It’s a clear product of the late eighties and early to late nineties, and I can’t blame it for what it was. It started a few years after Dragon Ball, and I can’t help but wonder if Araki’s hyper muscular style didn’t influence Dragon Ball’s latter art style. When reading Toriko for the first time I made comparisons between said series and Dragon Ball. After reading JoJo I’ve had to amend that statement. It’s a call back to Dragon Ball, as well as JoJo and other contemporary series, such as Fist of the North Star. If nothing else, I feel that JoJo is an incredibly influential series. The melodrama, the fights at least every other chapter, all these things are found in modern shonen, and if nothing else JoJo is a series fans of the genre need to read. It takes the cheese we love in fighters and focuses it into pure testosterone. One could inject JoJo just as effectively as reading it. I don’t think I’ll declare this one of my favorite series, but part three is shaping up to be a major improvement over the first two parts. There’s an inherent silliness that I can’t quite get over, but that’s just part of the experience.